Jaipur 24, June 2014 Deepshikha Mahila Bal Utthan Samiti and Deepshikha’s Compucord organized Training on “Stress Management and Developing Self Esteem” organised at Deepshikha’s Compucord, Hatwara Road, Sodala, Jaipur. Students from different schools and colleges participated in Training. 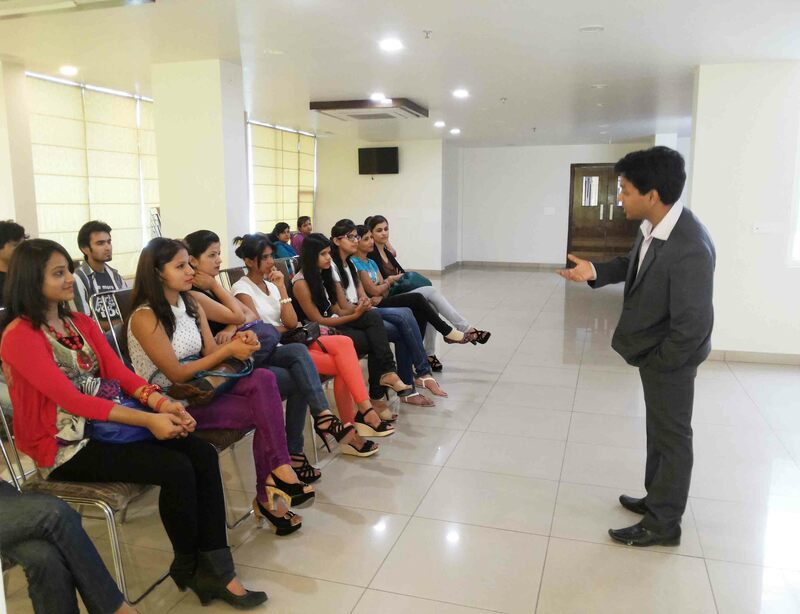 Internationally certified Motivational and Corporate Trainer- Shikhar Prajapati trained the participants. He gave the tips on Stress Management. He told – Do one work at a time and avoid multitasking, meditate yourself for calm and peace, be with nature, avoid continuous use of emails, social networking sites, messages- keep a time aside for all these, make timetable and follow it, prioritize the work, listen music, do exercise daily, take sleep for 7-8 hours daily, be with little children, enjoy time with family members, watch comedy shows and read jokes, tell someone about your stress it will become weak, learn something new,help the needy, eat vitamin-c enriched fruits and vegetables, work with positive attitude and lastly be thankful for all which you have. Participants enjoyed relaxing music for relaxing the mind and soul during the training. Be in positive atmosphere, upgrade your skills, don’t leave work on god instead do hard work to get success, respect your work, feel good for yourself it will help in making good relations, help the needy, read motivational books, appreciate others, be disciplined yourself and keep patient don’t leave faith. Training included games, role plays, icebreakers, videos and energizers. Jaipur 18, June 2014 Deepshikha Mahila Bal Utthan Samiti and Deepshikha’s Compucord organized Training on “Public Speaking and Body Language” at Deepshikha’s Compucord, Hatwara Road, Sodala, Jaipur. Students from different schools and colleges participated in Training. On Body Language, Shikhar Prajapati told how to use positive body language during communication. He told about handshake styles, walking styles, meeting styles, using of different body parts to make communication effective. Deepshikha Mahila Bal Utthan Samiti and Deepshikha’s Compucord organized Event- “My Papa Is The Best” on occasion of Father’s Day. Event organized at Deepshikha’s Compucord, Hatwara Road, Sodala, Jaipur. “The Greatest Gift I ever had come from God- I Call Him Dad”, “Father gives me many gifts, he loves me very much, he do hard work for family – I love My Father”, “A father is someone you look up to no matter how tall you grow.” “My dad is simply the greatest man I have ever known and I’m so proud to call him mine.”, “Thank you Dad for all you have done for me”, “He can play like a kid, give advise like a friends and protect like a body guard.”, “A Father means so many things, An understanding heart, A source of strength and support right from the very start.”, “You are everything to me, Whom i can share my all secrets, You are always there to help me, May u live long”, etc. Shikhar Prajapati Director of Deepshikha’s Compucord told that all participants honored with Participation Certificates and Prizes and also offered educational scholarships. Gulbahar Khan, Megha Soni and Aayushi Arya chosen as the Best Card Designers in the Event. Event supported by Simply Jaipur. Jaipur 30 June,2014. Deepshikha Mahila Bal Utthan Samiti and Deepshikha’s Compucord organized Personality Grooming Session. Session organized at Hotel Apple Inn, DCM, Ajmer Road, Jaipur. 30 male and female models and participants of Pinkcity Pearls Model Of The Month participated in the Session and enjoyed the knowledgeable and entertaining session related to topics of Personality Grooming. At last, he told that “we should see dreams as we are having capacity to fulfill them”. The Session consists of games, role plays, icebreakers and motivational videos.